Springtime concerns about travel bans hampering summer travel faded, and as summer 2017 draws to a close, it seemed on track to equal or surpass the strong summer travel seasons of recent years. From a digital perspective, our analysis of traffic to travel sites — which is highly seasonal, peaking in the summer — showed this summer’s peak of 1.07 billion visits in July is almost exactly the same peak as in July 2016. The future continues to look bright, as consumer enthusiasm for travel, and experiences more generally, continues to grow. Like many aspects of the digital world, travel has a few dominant players. In the U.S., there are two reigning giants in the digital travel world: Expedia and TripAdvisor. TripAdvisor leads by far in the amount of traffic, averaging nearly 100 million visits per month. With its huge amount of user-generated content (UGC), and its SEO savvy, they get a whopping 71% of their traffic from organic search. 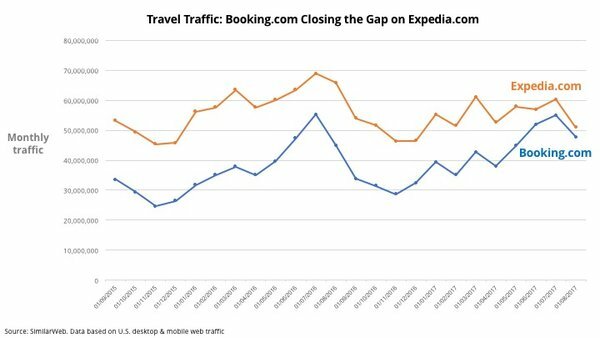 Expedia is second behind TripAdvisor in the sheer volume of traffic, but that’s before including all the traffic to Expedia-owned sites, a broad portfolio that includes Travelocity, Orbtiz, Hotels.com, Trivago, Hotwire and HomeAway. Expedia gets 37% of its traffic directly, reflecting its strong brand and loyal following; it also leads competitors (by far) in the typical amount of time visitors spend on the site. Most hotel and airline brands can’t simply walk away from the giants — brands need some visibility (and incoming customers) from the giants, but they want to maximize their direct sales, and minimize the giants cannibalizing sales the brands could have gotten directly. It’s a complex balancing act; it takes a lot of data, and a lot of refined pricing strategies to make it work. Consider this summer’s dance between Hyatt and Expedia. In June, Hyatt had threatened to leave Expedia over high commissions; later it was reported that “hardball negotiations” were underway. In July, Hyatt ramped up the pressure, signing a new distribution agreement with Booking.com. But as July drew to a close, the outcome had settled in where it had always seemed likely to end up. Hyatt CEO Mark Hoplamazian summed up their strategy: maximize the direct channel (“drive bookings through Hyatt channels so we can build stronger relationships with our guests”) while leveraging the reach of Expedia and Booking.com (“We recognize the value of online travel agencies keeping Hyatt top of mind for customers”). The devil, as always, is in the details: fine-tuning which rooms are offered at which prices on which platforms, all in the delicate balance of maximizing direct sales, but bringing in customers it would not have otherwise gotten via OTAs. In the final analysis, the continued growth of the travel category creates opportunities for new and current players. What stands out are the distinct strategies different giants have used to grow — TripAdvisor maximizes its audience via UGC, SEO and organic search; Expedia leverages its brand name, direct traffic and existing customers; Booking.com has joined the club by using overseas revenues to fund PPC-fueled growth in the U.S. Success lies at the intersection of a growing category, a sound strategy, and execution that is continuously measured and refined.